The Song: "There's A Kind of Hush"
"There's a Kind of Hush" is a popular song written by Les Reed and Geoff Stephens which was a hit in 1967 for Herman's Hermits and again in 1976 for The Carpenters. The song was introduced on the 1966 album Winchester Cathedral by Geoff Stephens' group the New Vaudeville Band; like that group's hit "Winchester Cathedral", "There's a Kind of Hush" was conceived as a neo-British music hall number although it is a less overt proponent of that style. Alright now, it’s time to cast your vote! In the comments, please enter who you are voting for and why you chose them. Voting ends 3/21/17 @ 6pm EST. Stay tuned, results will be posted on the 22nd! I've got your vote counted for the Carpenters. Thanks for dropping in to cast your vote. I like all three versions myself, so I know how hard it was to choose. I've got your vote for Herman's Hermits counted. I have to go with the Carpenters. Hearing her beautiful voice makes me almost want to weep, especially when I think of her tragic death. Be well! Karen Carpenter's death was truly tragic. She was so very talented in many ways. Did you know she was known for her drum skills as well as her voice? I've got your vote for the Carpenters counted. Appreciate you stopping by. It's always so hard to choose, each version really is nice! But I loved her voice, so, I'll go with The Carpenters. Another vote for the Carpenters. It's going to be interesting to see how this battle turns out. Thanks for taking the moment to cast your vote, truly appreciated! I'd forgotten that this song was on the NVB album. 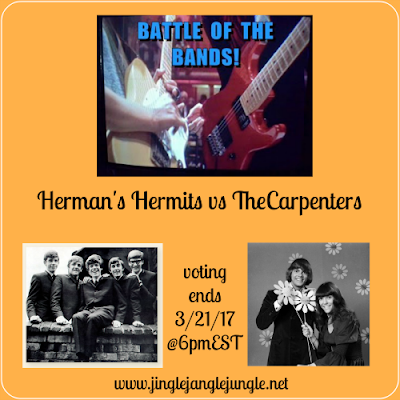 AS lovely a version as the Carpenter's perform--though it's a bit schmaltzy--I must vote for Herman's Hermits. The Carpenters version is a bit too slick and commercial sounding. Herman and his boys provide that boyish innocence and silliness that pervaded so much of their music. A vote for Herman's Hermits. I think this is turning out to be a very interesting battle. Thanks for stopping in to cast your vote. It's going to be a close one, I think. I was just a baby when the song originally came out, and then covered a year later by Herman's Hermits. Even though my older siblings had me listening to the original and HH, I have to agree that the Carpenters have the most memories for me as well. Thanks for stopping by. I've got your vote for the Carpenters counted. I had no idea that this song was a New Vaudeville Band original! (So much interesting trivia to be found in BOTB.) Now I am definitely going to have to add their 'WINCHESTER CATHEDRAL' album (abbalouly love the title track!) to my Spotify account and listen to it. I have a strong feeling I've been missing out on something I'd love for 57 years now. I was very much familiar with both versions of 'THERE'S A KIND OF HUSH' in this Battle. And I can tell you this: Although they could have used more cowbell and megaphone, I am a massive fan of The Carpenters. In fact, I'd have to say that Karen is my all-time favorite vocalist, including both women AND men. It's close to inconceivable that I would ever vote against THE CARPENTERS in a BOTB contest. It certainly ain't happening here, that's for sure. Two cool Battles in a row, Mary, and now I have a new old group to look into. One of the things I love about these battles is learning little bits of trivia. With both contenders having had commercial success, it's making for a very good battle. Currently a slight lean toward one contender, but we all know that can change at any given moment. I hope these battles never end. It would be a very sad day in my world if that happened. Enjoy your earworm for the day! "Cant get carpenters vid to play hermits played fine......but im picking the carpenter's cause love them"
Not sure why the video isn't working for you, but thank you for taking a moment to cast your vote. Much as I love Karen Carpenter's voice, I don't like the music they put with this one. Herman's Hermits' version was the first record I got after Dad died, and I always associate it with that period where my life was getting back to normal, finally. I'll vote for Herman's Hermits here. By the way, one of the pictures in that HH video looks like Pete Cetera. Notice that? WOW. I had not noticed that until you pointed it out. That pic is of Peter Noone, and in some of his pics, he does bear a resemblance of Peter Cetera. Thanks for pointing that out! Appreciate you stopping in to cast your vote. I've got you down for Herman's Hermits. Thanks again! I love them both but I think Herman's Hermits nailed it. But the Carpenters were spot on too. Great choices!!! This is becoming a very good battle. It will be interesting to see who comes out at the winner. I've got your vote for Herman's Hermits counted. Thanks for stopping by! Herman's Hermits hands down! Love both though. Another vote for Herman's Hermits is logged into the books. Appreciate you stopping by to cast your vote. A vote for the Carpenters has been counted on your behalf. Thanks for stopping in to vote! I think I have to go with The Carpenters. Another vote for The Carpenters. Thanks for stopping by! I love both bands, but gonna go with Herman's Hermits on this one since that is one of my favourites that they sing! Another vote for Herman's Hermits! This is quite the battle... Thanks for stopping by to casts your vote. Okay, the Hermits were a fun group, and I like a number of their songs, but I can't think of anyone who can outdo anything Karen Carpenter did. A vote for Karen Carpenter. Thanks! From Facebook: Diabolic Moss "Hey Mary dam when I tryed to post in comments it was like trying to get into Fort Knox but if yopu can count me as a Hermits vote takes more than Knaren voice to make a goog song"
Another vote for the Hermits. Thanks for your vote. Hope all is well with you. This is such a fun idea. I don't know much about this type of music, so I'm probably not the best judge. I'd have to go with the Carpenter's. Actually, not being familiar with the music is probably the best scenario - this way you are not as biased toward any particular contestant. A vote for the Carpenters has been counted. Thanks for stopping in! I love The Carpenters, and I thought they'd win my vote, but Herman's Hermits had such a great sound to it. "Herman" isn't quite the silky voiced angel that Karen Carpenter was, but the overall package sold me. Herman's Hermits for us! Herman does tend to take one by surprise! Appreciate you dropping by to cast your vote! It's going to be a close one. So fun! We have a friend whose mom was a Herman's Hermits 'groupie' back in the day and actually ended up friends with a member of the band. They've stayed with him on vacation. So of course they have to get my vote! Hey Susan! That's pretty cool! They seem like a really fun band to be friends with. Thanks for the vote! From Twitter: @Snapshotandsnippets "Have to vote for Herman's Hermits because my Dad knew them - Dad was a bass player in the 60's"
From Facebook: Vanessa Connor "Carpenters! I may be biased..."
It's looking to be quite a tight race! It will be very interesting to see the final outcome. I used to wake up to the Carpenters (or sometimes Donny Osmond) every morning in the early 70's. I was just a tiny person then, but shared a room with my teenage sister. I've counted your vote for the Carpenters. Thanks for stopping in! From Facebook: Arnold Stonebrink writes "Tought decision! Great group with great charisma, and good singers and good people as well. But I have to go with the Carpenters; it's just hard to beat Karen's voice. Hey Arn! It is a tough one.. two good contenders that placed well on the charts with their covers. It's interesting to watch the votes go back and forth. Thanks for your vote! I love both but I have such a soft spot for Karen Carpenter that.... The Carpenters win for me! Thanks for your vote. I've got you down for the Carpenters. Tough choice, as they both sing it fantastically! I have to go with the Carpenters though, because I just love them. I've got you down for the Carpenters.